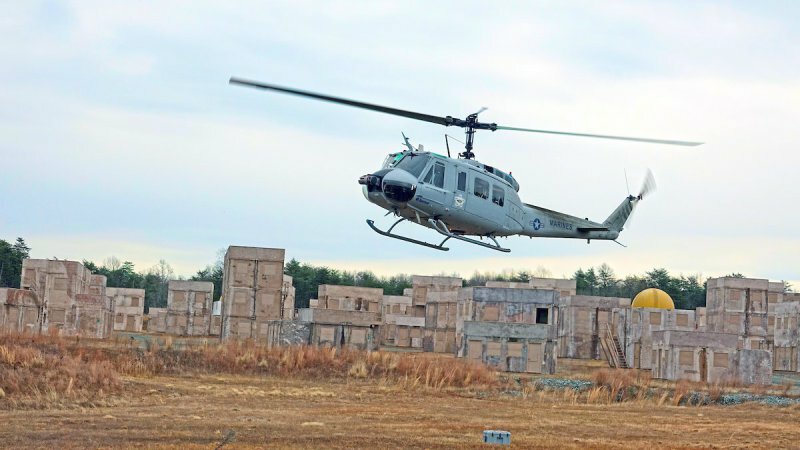 QUANTICO, VA. --- Aurora Flight Sciences conducted a successful demonstration of the company’s autonomous helicopter system developed under the Office of Naval Research’s (ONR) Autonomous Aerial Cargo Utility System (AACUS) program. 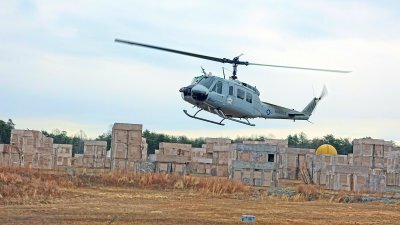 Held at Marine Corps Base Quantico’s Urban Training Center, the AACUS-Enabled UH-1H (AEH-1) conducted multiple flights, showcasing its ability to autonomously execute re-supply missions in relevant and austere settings. AACUS is an aircraft-agnostic hardware and software suite which enables a Marine on the ground to request a supply delivery via helicopter from a handheld tablet, requiring no advanced training to operate the system. AEH-1 is fitted with onboard lidar and camera sensors that enable it to detect and avoid obstacles and evaluate the landing zone. The system processes this information to perform onboard mission, route, and path planning to enable autonomous mission execution. While previous demonstrations have showcased the system’s autonomy capabilities and interactions with trained operators, this is the first demonstration in which the aircraft performed cargo and utility missions in an operationally-relevant training environment with Marine interaction. As part of the demonstration, Marines loaded supplies for the aircraft before clearing the autonomy system for autonomous takeoff. Aurora has developed multiple technologies under the AACUS program: the digital flight control system which enables the UH-1 to fly autonomously; and the Tactical Autonomous aerial LOgistics System (TALOS) autonomy technology. The AEH-1 was granted a Special Airworthiness Certificate by the Federal Aviation Administration (FAA) in October, allowing the aircraft to operate autonomous with only a safety pilot onboard to monitor the controls. Today’s flights served as the final demonstration to ONR, Department of Defense representatives and other senior officials, the culmination of a highly successful five-year Innovative Naval Prototype (INP) program. Having completed the third and final phase of the program, AACUS will now transition to the Marine Corps for experimentation and potential acquisition. Aurora Flight Sciences, A Boeing Company, is an innovative technology company which strives to create smarter aircraft through the development of versatile and intuitive autonomous systems. Headquartered in Manassas, Virginia, Aurora has more than 550 employees and operates in six locations, including research and development centers in Cambridge, Massachusetts, and Luzern, Switzerland; manufacturing facilities in Bridgeport, West Virginia, and Columbus, Mississippi; and offices in Dayton, Ohio, and Mountain View, California.